The Louisiana Old Governor's Mansion was built in 1930 under the governorship of Huey P. Long, its first resident. The building, of stucco Georgian construction, is reported to be a copy of the White House as it was originally designed by James Hoban. It is said that Governor Long wanted to be familiar with the White House in Washington when he became president, so he had the White House duplicated in Baton Rouge. Some dispute this legend and simply say that the mansion is merely a fine example of a Georgian mansion. This is the second governor's mansion to occupy the site. The first governor's mansion, a large frame house built for Baton Rouge businessman Nathan King Knox, served as the official residence of Louisiana governors from 1887 until 1929, when it was razed. The architects for the neoclassical mansion were Weiss, Dreyfous, and Seiferth of New Orleans. The building has two floors, a full basement, and an attic. The slate mansard roof has open balustrades and 14 windows set in a small gable projecting from a single roof. Four large 30-foot Corinthian columns support a pediment adorned with carvings depicting a pelican feeding her young framed by ornate scrollwork, a design based on the Great Seal of the State of Louisiana. Governor Long's plan to destroy the previous antebellum mansion met with opposition. Despite great public disapproval he had the old mansion raised by convicts from the State Penitentiary. When impeachment proceedings began against the Governor in March 1929, one of the 19 articles of impeachment was that he destroyed the old mansion and another accused Long of destroying and disposing of property and furniture from the Governor's mansion, the capitol, and State offices. Huey Long failed to be impeached, and the new mansion was completed in 1930 and members of the State legislature attended the official housewarming party on June 27, 1930. In 1961 Governor Jimmy Davis moved into the present Governor's Mansion, thus ending this mansion's 32 years as the official residence of the Governors of Louisiana. The Old Louisiana Governor's Mansion is located 502 North Blvd. between Royal and St. Charles Sts. in Baton Rouge. 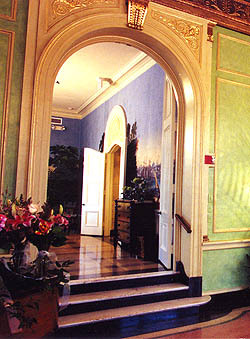 The mansion is open for tours 10:00am to 4:00pm Tuesday-Friday. There is a fee. Call 225-387-2464 for further information or visitor the mansion's website.